This is where you should be having breakfast. Republique, Walter and Marge Manzke’s bistronomie experiement that’s housed in the old Campanile space, has been serving dinner since late last year. Recently, the bakery component of the concept opened to the public. Vietnamese coffee and cafes au lait are served in earthenware handmade by a friend of the family. They offset perfectly proofed bomboloni, delicate apple and lemon tarts, moist danishes, and flakey croissants. 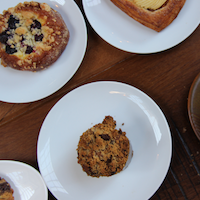 Breakfast pastries are served Monday through Saturday beginning at 8 a.m.
Republique, 624 S. La Brea Ave., Mid-Wilshire, republiquela.com.